With AMD and NVIDIA shares soaring in the past year, which semiconductor stock looks like the better buy for long-term investors? 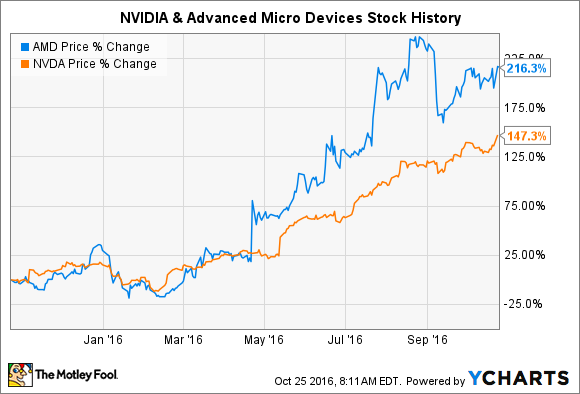 With their stocks soaring in the last year, it's been an incredible time to be a shareholder of semiconductor stocks NVIDIA (NASDAQ:NVDA) and Advanced Micro Devices (NASDAQ:AMD). To see which stock looks like the better buy going forward, though, let's examine AMD's and NVIDIA's stock histories, the financial trends underpinning their recent rises, and the long-term outlook for their respective businesses to see which stock remains the better buy today. WIth the stock tripling in the past 12 months alone, investors clearly see a major opportunity ahead for AMD. As longtime second fiddles to rival Intel in the PC CPU market, AMD and NVIDIA have benefited mightily from a resurgence of interest in graphics-intensive computing in a number of markets. Specifically, AMD's move deeper into semi-custom graphics chips that ship into video game consoles has proven to be a boon for the company of late. Case in point: Revenue from its semi-custom chip segment increased about 5% in AMD's most recent quarter. However, I'm not so sure the rally in AMD stock can sustain itself. Looking to the bigger picture, several red flags emerge in AMD's business model that could conceivably reverse the recent GPU market share gains it has achieved. For starters, there is increasing competition in graphics chips, since NVIDIA -- traditionally the high-end vendor in the GPU market -- recently launched its GeForce GTX 1050 and 1050 Ti chips. These chips target the lower-cost segment of the market where AMD has recently been able to eke out some market share gain. The company's balance sheet isn't particularly impressive, either. AMD carries about $3.3 billion in total assets, compared to $2 billion in long-term debt. This isn't an acute issue, but interest payments on its debts do create one more headwind for a company still struggling to switch to profitability -- which is by no means the case for NVIDIA . NVIDIA shares many of the same opportunities as AMD, but the company's long-held status as the premier graphics processing chipmaker has allowed it to branch this specialization into a number of emerging growth areas -- and to do so better than its rival. The rise of competitive gaming is one area that few -- myself included -- expected to grow into a major business, but NVIDIA's wares have become the leading chip for the professional gaming industry, which favors the computing power of PCs over consoles. Self-driving cars also serve as another emerging source of significant opportunity for NVIDIA, since they use many external sensors to gauge their surroundings and behave accordingly. Strange as it may sound, discerning in real time whether the object next to it is a person riding a bike or a car requires a tremendous amount of graphics processing power, for which NVIDIA has also created a series of turnkey solutions. NVIDIA enjoys a similar opportunity in big data and AI visualization, but by now, hopefully you see a trend. The general direction of computing and technology is toward more graphics-intensive activities, and NVIDIA stands to be the beneficiary of this movement, perhaps more than any other company. Equally compelling is the fact that NVIDIA is also profitable and enjoys a strong balance sheet. Its 47 times P/E ratio makes the company about twice as expensive as the broader market. However, given the generational nature of some of NVIDIA's opportunities, the company could easily outgrow that valuation for investors willing to hold its stock over the long term. Hopefully, the likely winner in this scenario is abundantly clear. NVIDIA has the better business model, technological leadership, and a stronger balance sheet, and it has already achieved profitability. What's more, NVIDIA's move into some areas that have driven AMD's recent success threatens to derail AMD's growth story before the company can flip to profitability. Here, the conclusion is obvious. NVIDIA is the better semiconductor stock for investors to buy today.